Fun With Puzzles Brain Teasers Can you Read this Picture Puzzles Can you read this in first attempt? 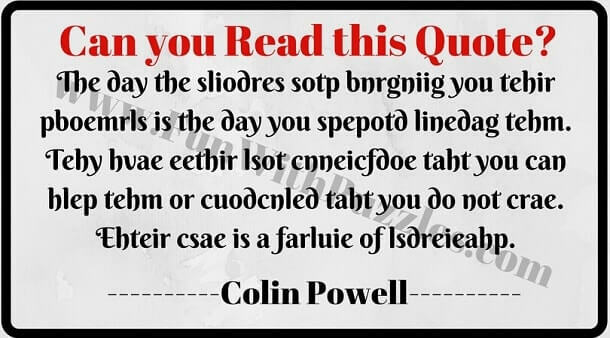 Can you read this in first attempt? 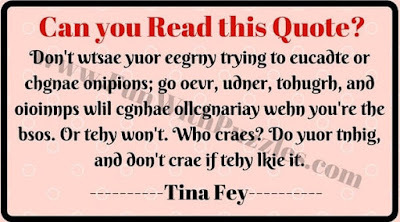 Yes, you can read this. In the first instance, it will look difficult to read this but our mind is very powerful. With our knowledge it can re-create the words if we can scramble the letters in the word randomly but keep first and last letter intact. Not only our mind can read encrypted words but also it can read any blurred text. It can also read if the text is turned upside down. 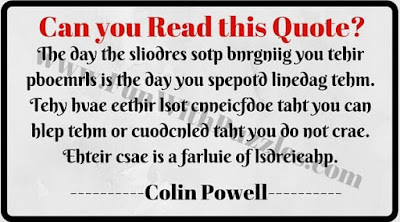 It can read it easily if the text is turned backward. So any situation it can ready very clear but with some effort. I found most tough to read when the text is turned upside down and backward. Try all these reading challenges which are there on this website and let us know about your comments. 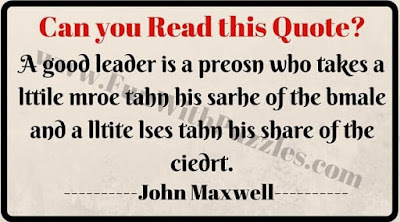 In these there are quotes on leadership by famous people. These quotes has been encrypted. In this encryption the letters which makes word remains same but there positions in the word are changed. However first and last letter retains its original position. 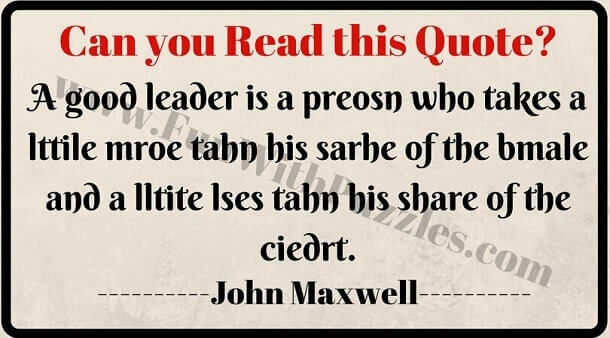 Can you take this reading challenge of reading these quotes in first attempt? 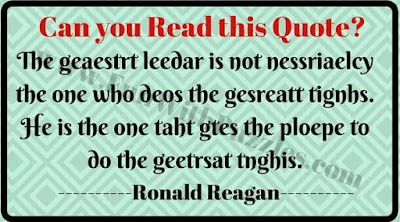 Do post in the comments these quotes if you are able to read these in the first attempt. 1. Can you read this? 3. Can you read it in first attempt? 4. 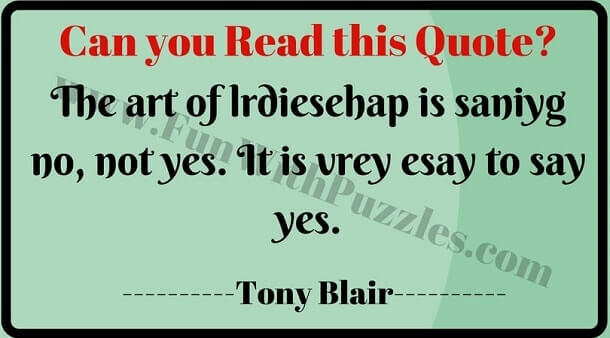 Can you read this puzzle? 5. 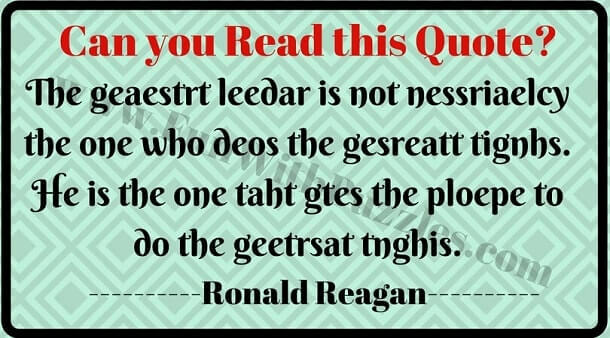 Can you read it in 1st attempt? 1. 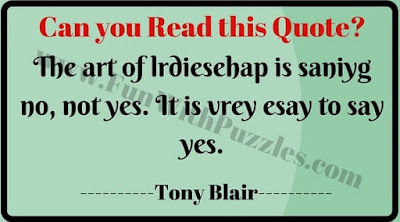 Intelligent Reading Puzzles to Twist your brain: Another set of Reading puzzles in which there are different types of challenges from reading the scrambled words to reading the hidden numbers etc. 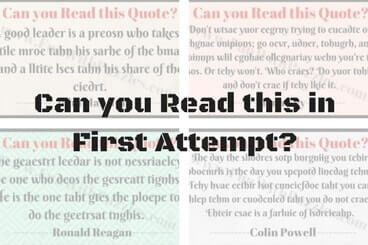 Do check it out these reading puzzles which will twist your brain. 2. Brain Test to Find Mistakes in Puzzle Images: After becoming expert in reading any kind of text, its now time to find the mistakes in the given Puzzle Picture Images. 3. Find the Number of Squares and Triangles in the given Pictures: Can you count? If the answer is yes, then try out these picture puzzles in which your challenge is to count the number of squares or triangles. 4. Finding Hidden Objects Brain Teasers for Teens and Kids with Answers: After solving all these picture puzzles you are not expert in solving visual puzzles. Take another observation test in which your challenge is to find the hidden objects in the Picture Puzzles. 1) The greatest leader is not necessarily the one who does the greatest things. He is the one that gets the people to the greatest things. 2) The day the soldiers stop bringing you their problems is the day you stopped leading them. They have either lost confidence that you can help them or concluded that your do not care. Either case is a failure of leadership. 3) A good leader is a person who takes a little more than his share of the blame and a litter less than his share of the credit. 4) The art of leadership is saying no, not yes. It is very easy to say yes. 5) Don’t waste your energy trying to educate or change opinions; go over, under, through, and opinions will change organically when you’re the boss. Or they won’t. Who cares? Do your thing, and don’t care if they like it.